Thunderbolt 3 housing pro low-profile kartu (x8 PCI Express 3.0 slot). 40Gbps Thunderbolt 3 rozhraní zajišťuje plnou šířku PCIe pásma (2750MB/s). Dvě Thunderbolt 3 (USB-C) rozhraní - jedno pro připojení k počítači, druhé pro připojení až pěti dalších Thunderbolt zařízení, nebo pro připojení dvou 4K monitorů (popř. jednoho 5K). Nejmenší provedení na trhu s tichými větráky. Robustní hliníkové tělo. Shopping for a new computer? Small and thin is in—the latest ultra-light notebooks, small form factor, and all-in-one desktops are slender marvels of engineering. But, thinness comes with a cost—there’s nowhere to install PCIe cards that provide additional connectivity and processing capabilities beyond a computer’s standard ports. Thin Mac® and Windows®(1) computers with Thunderbolt™ 3 ports still offer tremendous processing power, but for many, such as pros in the creative fields, onboard processing power alone is not enough. Fortunately, you don’t have to limit your choices to desktop workstations—think external. 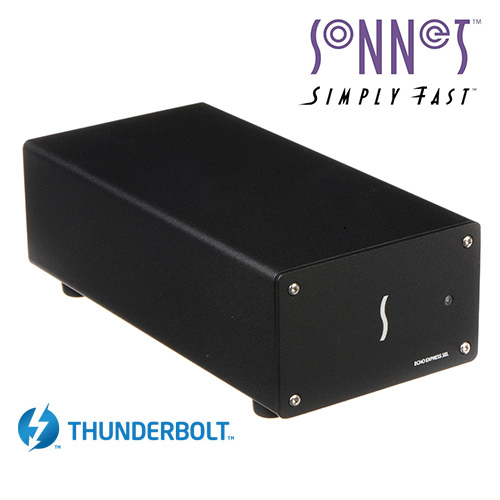 Sonnet’s Echo Express SEL - Thunderbolt 3 Edition enables you to connect a single low-profile PCIe card outside of the computer. 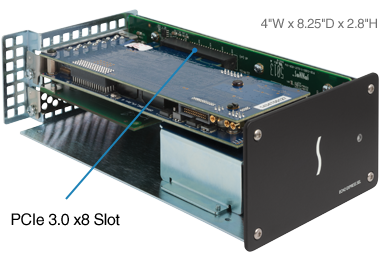 Through its x8 PCIe 3.0 slot, this little Thunderbolt 3-to-PCIe card expansion chassis supports many Thunderbolt-compatible 16Gb and 8Gb Fibre Channel, 40Gb and 10 Gigabit Ethernet, video capture and processing, SAS and SATA host bus adapters, and RAID controller cards. The Echo Express SEL - Thunderbolt 3 Edition features 40Gbps Thunderbolt 3, which offers double the speed and connectivity of Thunderbolt 2, and yields up to 2750 MB/s of PCIe bandwidth, enabling it to support 4K video capture and processing cards at high frame rates, and 16Gb FC cards and dual-port 10GbE cards at full performance(2)(3). With the ability to handle the most demanding, highest performance PCIe cards, support for connecting two 4K displays @ 60Hz or one 5K display @ 60Hz(4), and support for a vast array of Thunderbolt(5) and USB(6) peripheral devices, Thunderbolt 3 is a leap forward in every way.